Why is Weber GS4 so special? The long wait is over. The new Weber Genesis II and II LX models have now officially hit the market, and the moment of truth has come to determine whether this release is nothing more than a marketing gimmick or it’s indeed a well-thought-out and feature-rich rollout for a truly impressive new product. The GS4 high-performance grilling system answers these questions with very little room for misunderstanding—it's packed with fantastic features and significantly improves on its predecessors without losing sight of what makes Weber grills great, making it a heads-and-shoulders choice above most of its competitors. The GS4 system features four primary elements present in new Weber Genesis II and II LX models, each one a powerful and impactful influence on the grilling experience. One of the most impressive new aspects of the GS4 high-performance system is the Genesis II LX All-Grill igniter. With a single control, you can turn on, adjust and fine-tune the overall temperature of the entire grill surface instantaneously. This powerful feature makes the Genesis II series a distinctive upgrade from previous models, and provides master grillers a streamlined and straightforward method for controlling the entirety of their grill surface. A grill is only as good as the quality of its burners, and in this arena the Genesis II series and its GS4 high-performance system simply cannot be beat. Completely redesigned from the ground up, the new GS4 burners are built to withstand the most rigorous grilling experiences and keep going strong even after years of use. One of the most distinctive elements of their redesign is their maximized power (up to as much as 60,000 BTU-per-hour) as well as their increased durability when exposed to extreme, intense heat. Many other burners will eventually begin to wear, corrode and lose their effectiveness—but the GS4 burners are built with a singular level of strength and resistance to natural wear and tear. While they certainly live up to their name, GS4 Flavorizer Bars are much more than just a method of adding extra flavor to your grilled meals. They’re also built to minimize flare-ups while grilling as well as performing an important duty in evaporating drippings. As a wonderful byproduct of this dual function, they help to imbue grilled foods with a delicious smoky flavor. Standard models feature porcelain enamel flavorizer bars while higher-end models feature bars made from stainless steel. You might also notice a small notch on each of the flavorizer bars. When we asked Weber about this detail, their answer was a bit surprising but speaks to Weber’s dedication to giving their customers what they ask for. Weber found that in previous models, customers were troubled by the fact that they could not see if the burners were on as their view was covered by the flavorizer bars. As a result, Weber opened the small notch on either side in order to give a glimpse of the burner in action. Grease is a constant consideration when grilling, one that must be accounted for by the grill itself or become a frustrating and cumbersome burden to the griller (not to mention a means of quickly wearing down and corroding the grill itself). Thankfully, the GS4 system doesn’t scrimp on grease management, either. Weber’s updated grease management system uses special channels that funnel grease directly to your removable drip tray for easy, quick and efficient cleaning. It can be easy to underestimate how much of a positive effect an efficient grease management system can be for a grilling experience. By taking concerns about grease out of the equation, grilling becomes a more enjoyable, laid-back and straightforward activity that allows you to focus on what matters most—having a great time while cooking great food. 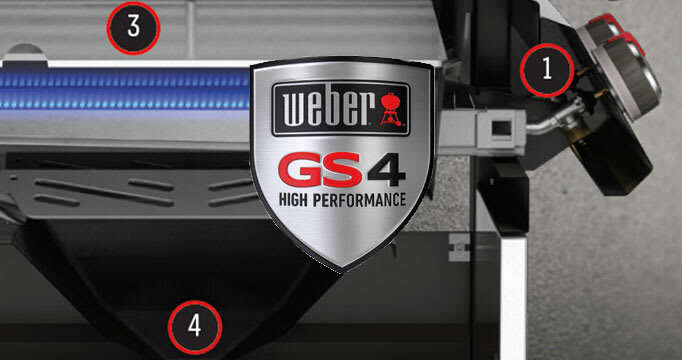 The GS4 system is truly an impressive leap forward in the quality and effectiveness of Weber grills, one that represents the company’s ongoing commitment to providing their customers and users with the highest level of attention to detail and seamless grill experience. To find out more about the GS4 High-Performance Grilling System, the newly redesigned Weber Genesis II and Genesis II LX grills, or Weber products in general, you can read more on Designer Appliances and explore the entire Weber line.